Everyone knew it was crazy to try to extract oil and natural gas buried in shale rock deep below the ground. Everyone, that is, except a few reckless wildcatters - who risked their careers to prove the world wrong. Things looked grim for American energy in 2006. Oil production was in steep decline and natural gas was hard to find. The Iraq War threatened the nation’s already tenuous relations with the Middle East. China was rapidly industrializing and competing for resources. Major oil companies had just about given up on new discoveries on U.S. soil, and a new energy crisis seemed likely. But a handful of men believed everything was about to change. Far from the limelight, Aubrey McClendon, Harold Hamm, Mark Papa, and other wildcatters were determined to tap massive deposits of oil and gas that Exxon, Chevron, and other giants had dismissed as a waste of time. By experimenting with hydraulic fracturing through extremely dense shale - a process now known as fracking - the wildcatters started a revolution. In just a few years, they solved America’s dependence on imported energy, triggered a global environmental controversy - and made and lost astonishing fortunes. No one understands these men better than the award-winning Wall Street Journal reporter Gregory Zuckerman. His exclusive access enabled him to get close to the frackers and chronicle the untold story of how they transformed the nation and the world. The result is a dramatic stretching from the barren fields of North Dakota and the rolling hills of northeastern Pennsylvania to cluttered pickup trucks in Texas and tense Wall Street boardrooms. The story is well researched and best of all non partisan. Narration is very good too. In my estimation, this book does a good job walking the tight rope between "drill baby, drill!" and environmental concerns involved in the process of getting natural gas and crude oil from shale. I'm sure that many environmentalists will think that the author spends too little time addressing the ecological concerns and too much celebrating the figures that brought it in to being. The history of Fracking as this book lays it out is very interesting. We learn that Fracking isn't a result of Big Oil on their quest for increased global dominance, but rather the small time operators trying new approaches and technologies to make their humble operations profitable. My only major issue with the book is the timing. The story over fracking is still unfolding and it's impact on the global scene, local communities and the environment hasn't even come close to being realized yet. Due to that, the book's narrative fizzles out at the end. I was more interested in the first 2/3 than the final 1/3. I'm also not sure why Charif Souki, with Cheniere Energy is profiled in the book so extensively other than his interesting back story. 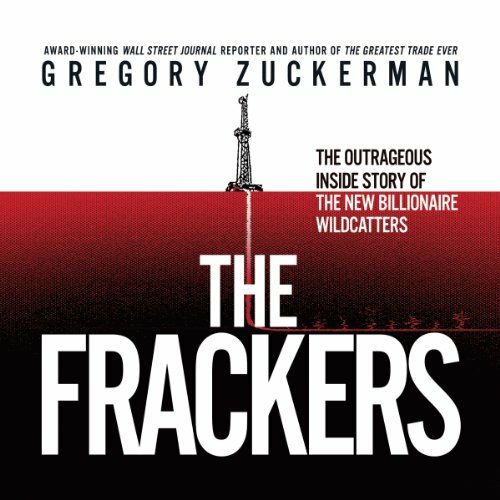 Would you consider the audio edition of The Frackers to be better than the print version? Very even and easy to listen to. Inflection was good, and not overdone. A must for those in the industry. It gives you a good understanding of the environment of the medium sized oil and gas business in America. Easy listening and easy to understand. Smooth narration, very easy to listen to. Not too negative or overly positive sounding. This was an unexpected delight. I've always been interested in the topic of hydraulic fracturing after watching the documentary film Gas Land, but for it to be a story about several different people and their paths in history, it was something I didn't want to stop listening to. It was also very even keeled since he points out all aspects of it, especially around the Dimock, PA wells. Great narrator, made the time fly - not sure how the print version would've read. George Mitchell - he was a pioneer who wouldn't give up, particularly after he was so frequently counseled against it. Would have if I had that kind of time. I knew little of fracking or the people involved. This was a great story illustrating how it developed and came to be as well as the people and the chances they took to succeed. I was hoping for more story. This is a story, but it is just about the people, it is a constant narrative of names. So and so did this, etc., etc., etc. Excellent Book but Mispronunciations Abound! A true story of good ol' American ingenuity solving problems to make a buck and in the process did away with the concept "peak oil". The narrator is excellent and very easy to listen to, but there was a fatal flaw. I cringed every time he said Chiniere or Schlumberger. Mr. Pratt, please look up the pronunciations before you go and narrate and entire book and mispronounce the names of the primary companies in the book. Chiniere is pronounced shin'-uh-ree not shin-aire'. Being connected with the oil industry, these names are available on the internet or just listen to CNBC for a few hours and you'll hear these pronounced correctly. Chiniere is pronounced shin'-uh-ree, not shin-aire'. Shlumberger is pronounced shlum'-ber-zhay not shlum'-burger. Otherwise, the story is fascinating, and the author did a fantastic job of showing a few pieces of the puzzle of how the process of fracking opened new energy to the US in a modern equivalent of finding the new world. What disappointed you about The Frackers? There is not a story here. These are average men who won the lottery, with no drama, no passion, and nothing to interest the reader. If you have EVER read another biography, you need not listen to this paper thin piece of "journalism." I have no idea what possessed Mr. Zuckerman to waste years of his life writing this book, since there is literally nothing to set the subjects of his book apart from, say, your average restaurateur, or real estate developer. The topic is an interesting one, but Zuckerman has grasped failure from the jaws of victory by drafting painstaking portraits of men without character or distinction. Beyond the dryness of the biographies, there is no meaningful explanation of the science or technology behind hydraulic fracturing. In all fairness, I could not devote more than 2 hours of listening to the book, but in that two hours there was nothing to keep me coming back, so a more patient reader might find that somewhere in the bowels of this book are some specks of insight. I should note that I am a fairly prolific audio listener, I am on pace to finish around 70 audiobooks this year, many of them biographical or industry related non-fiction, and this is the worst I have heard in recent memory. Further, the policy discussion in the book is nonexistent. Again, I couldn't take it for more than 2 hours, but the teasers of any policy discussion were thinner than you might expect from a two paragraph description of the subject in "The Week." I bought the book on sale for $4.95, and have considered requesting a refund, an all around failure. Has The Frackers turned you off from other books in this genre? No, I just finished a book about derivatives trading by Michael Lewis, (the Big Short) and he found a way to make a terrifically complex and boring subject into a nail biting edge of your seat narrative. The failure of The Frackers is in the author, not the genre. The narrator does a fine job. There is nothing wrong with his performance, and I would not hesitate to listen to another text with the same reader, but I purchased the book on the basis of its reviews, and I did not want someone else to see such an inflated number. My apologies to Mr. Pratt for the 3 star rating, it wasn't you. Story was great but the narration was horrible. Narrator didn't know how to pronounce words, specifically company names which he could have easily looked up online (Schlumberger and Total are two I remember him butchering many times). Also, the volume of his voice fluctuates a lot and trails off at the ends of sentences so you have to strain to hear or turn up the volume, only to be blasted once the new sentence starts. I've been in the oil business for over 20 years. I have been fracking my entire career. I found this book to be informative and balanced. I consider it a must read for every generation of oil professionals to come. One of the most amazing stories I’ve ever heard. This book has it all! I highly recommend this book for everyone, it reallis a great story and some of the greatest minds of our time.